Address: 15022 Aruba Location: Corpus Christi Type: Duplex View: Water View Area: 1679 Sq.Ft. COMPLEX/COMMUNITY Aruba Beach Getaway II is one of two sides in a stand alone duplex in the new Leeward Bay subdivision. 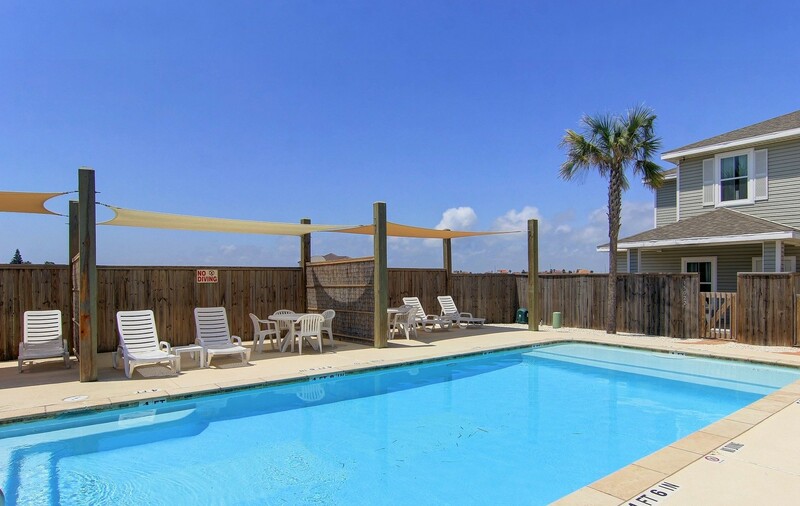 By itself Aruba Beach Getaway II is one of the best five bedroom properties on North Padre Island, it's the closest five bedroom to the beach and offers unmatched privacy. This property is part of the Leeward Bay subdivision but sits completely away from the rest of the townhouse units. Guests will enjoy a shared saltwater pool that is right outside your back gate, it's also heated for year-round enjoyment. Multiple grills and reserved parking are also provided for every property at this complex. You'll be a short walk away from the beach and the All New Schlitterbahn Water Park is just around the corner. Numerous restaurants and tourist shops are just 2 miles away and numerous area attractions are within a short drive. INTERIOR If you just book Aruba Beach Getaway II it comes with 5 bedrooms/3 bathrooms and a loft. Downstairs you have an open living, kitchen and dining area as well as a master bedroom with a king size bed, full bathroom and laundry room. A recent new addition to the downstairs offers two additional bedrooms and another full bathroom. One bedroom comes with a queen size bed and the other room that is great for the kids with a twin over full bunk bed and twin size trundle. Two more bedrooms with king beds are upstairs along with a loft that has a full size futon to sleep 2 additional guests. There is a full bathroom on the upper level as well. There is a queen size sleeper sofa in the living area and a full size futon in the loft to sleep a total of 16 guests on this one side of the duplex. Other features included are a fully-equipped kitchen, TV's in every bedroom as well as the living room and loft, 2 DVD players and your own private WiFi network. For a Virtual Tour of this property CLICK HERE This property requires a 2 night minimum during off peak season and a 3 night minimum during the summer season. Linens for every bed and bath towels for every guest are provided. IF YOU'RE LOOKING TO BOOK BOTH SIDES OF THIS DUPLEX PLEASE CALL OUR OFFICE. We rented both Aruba units for our family reunion of 22 people. As far as space went it was excellent. The location was very good, unfortunate for us there was a red tide that week, so we didn't utilize the close beach access. There was plenty of bedding and towels, and the pool made up for our red tide issue in the ocean. I did have a very huge issue with the cleanliness. the floors turned our feet a fuzzy black within four hours. the toilets looked clean on the outside but inside black mold! The dishes were also dirty. And some of the bedding were even dirty. That upset me the most because I was charged a cleaning fee for both units. why should I be charged if I'm walking into filth? We apologize for the cleaning issues you had to deal with. That is certainly not up to our usual standard. The floors have been an issue for us and we will be addressing them next month. We'll notify the cleaners of the toilet, dishes, and bedding issues and work on improving them. We again apologize for the issues you had to deal with but we do appreciate your feedback. Overall satisfied. Staff very responsive. Nice property. We had a great time. The place was clean and had everything we need it. We could have used more pots and pans since we were a large group. Overall we had a great time ?? I think you got the rating system wrong. 5 stars is good 1-2 stars is bad. You gave us 1-2 stars on everything but you say had a good time and recommend it to others. Glad you had a great time though. We'll get some more pots and pans in there. Thanks for the feedback. We brought a group of kids for a church event in Corpus Christi. We chose to stay here because we thought it would make for a more enjoyable experience than staying in a hotel. The kids had a blast! The only negative thing that could be said is that we could have used more towels than were provided. Thank you for your feedback. We would've been happy to provide your more towels upon your request. The property does come stocked with bath towels and wash cloths for every guests and there is a washer and dryer available. Hope we see you back again soon. Should consider that we bring families with children to these places, it was great but to sit children to eat on tall stool is inconsiderate. I hade an 8 year old that her foot got caught in the middle of the stool trying to get off when she finished her dinner, then fell 3 feet to the cement ground, fell folded on her spine while her foot still caught on the stooland screamed her lungs out in Pain. Please bring down the dining table, we had toddlers that needed to eat at a table as well. Doors on some rooms did not lock, we did not receive an emergency key besides the keypad code and got locked out, it happened while going to beach thru back door, a guest locked d door with pad lock and went out the back and locked d bottom one, yes it happens. almost calling a locksmith on a Saturday but managed to open it, laundry door handle slips off. Ice machine in tefrigerator had a melted block of ice in d chute and had to take it out so it can work. We hate to hear a little one fell and got hurt, we hope she's OK and we'll certainly pass along your feedback to the owner. That's the first we've heard of such an incident there. There is a shorter patio table with shorter chairs that would be ideal for kids. We will also make sure the laundry doors, ice maker and bedroom doors are functioning properly. If any of these issues were reported during your stay we would've been happy to address them. We appreciate your feedback and we will use it to improve our services for future guests. The house was awesome!!!! The staff was great. They checked on us from time to time. I couldn't have asked for a better stay!!!! We had a great time! Everything was perfect for us. There were 18 of us and we had both sides. Enough room for all of us to stay, and it was a very clean place. We would like to go back to the same place and house again. It was in a great location, close to stores, close to the beach, etc. Couldn't ask for anything more. "Perfect"
Beautiful place and location was perfect. Pool was wonderful and the gated area was a perfect spot for the little ones. We rented both sides to accommodate are large group and we had plenty of room. The beach was a block away and the location was close to other attractions. Even the rain didn't put a damper on our stay. Wonderful place! The rental was great!! The location was perfect. 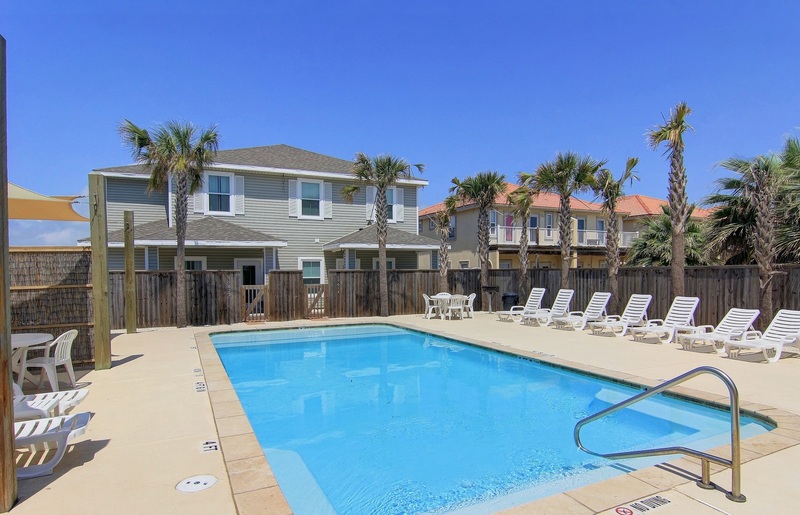 Close to the beach, within walking distance. Clean, with spacious rooms. Enjoyed the pool very much! The kitchen could use a few more utensils, a hand mixer, more towels and more pot holders. But all in all its a great place to spend your vacation at. I have and will recommend it to others. 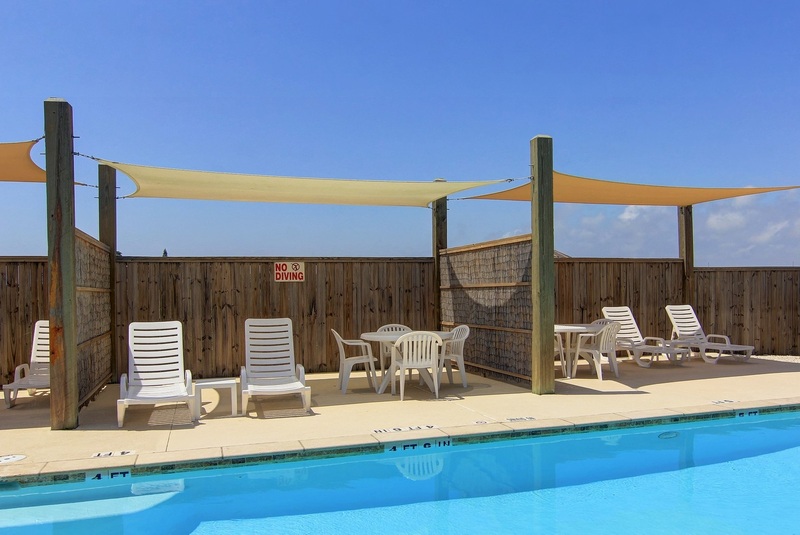 The people at Padre Escapes, are friendly and willing to accommodate you in any way.. TY for a great stay.. Thank you for the feedback, we'll work on getting a few more utensils in there for you. Hello, when we first walked in it smelled like a dog had urinated. Dog hail alll on the floor mat outside of the door. We rented both sides for our group of 17. Loved the fact that kitchen and living areas are downstairs plus one or more bedrooms. All but one of the bedrooms have either king or queen beds - bunk for 4 in the other one, plus futons and sleeper sofas. TVs in all bedrooms and living rooms - even in the upstairs hallways where the futons are. Convenient for my son who is in a wheelchair. Pool right in back. Only drawback is it is shared by several other units. Only about 2-1/2 blocks from the beach (easy walk). Large parking lot right next to the beach with ramps going down to the beach. Lots of places to eat and Schlitterbahn only about a mile away. We rented both sides of Aruba Beach and it was Great! Everything we needed was there and the pool access was amazing! Nice beach house but not a walking distance to the beach. Convenient to the beach though. It would be better if the check-out time were in the afternoon. The condo was great. We had 13 people in our party. We all had a place to sleep place was very clean and well kept. The only things I would have like to see would be cleaning items. Broom and or vacuum so we could tidy up. More kit ken supplies like a cutting board, good can opener, etc. other then that things were awesome. Would definetly stay there again. Rental property staff were so polite and helpful as well. We celebrated Christmas and Anniversaries for 5 days at Aruba Escape 1 & 2. There were 18 of us and the location was the best! The kiddos got to go to the beach, swim in the pool, and play in an area that allowed the adults to still watch football games. Great to hear everything went so well! Thank you for the feedback. We're looking forward to your return! The unit was serviceable but somewhat barren. There were no regular chairs. Kitchen well equipped. It was nice to have the pool right outside the back door. We had a wonderful time together, all 29 of us! Everything worked out but the beds and linens was not quite adequate, I had assumed enough beds for 32 people... turns out that couches and hide-a-beds are part of the count. Having youth sleep in the public areas was ok, but not idea. It was really good me and my Family enjoyed being there. WONDERFUL CANT WAIT TO GO BACK WHEN CONSTRUCTION IS DONE SO I CAN GO SWIMMIMG IN YOUR NEW POOL AND ENJOY THE VIEW. The pool is done and ready for your return! This place is AWESOME! Space for large families and within walking distance to the beach. We also loved that the pool was located a few steps away. My family and I could not have asked for a better place to relax and enjoy each other. Could have used a trash receptacle instead of having to walk our trash over to a dumpster on the other side of the swimming pool. Also, could have used a fly swatter. Otherwise it was an enjoyable stay. We had a wonderful time. We rented both duplexes, plenty of room and space for 25 plus! The location was easy to find. Easy access to the beach walking or driving! We had a wonderful time at the Texas State Aquarium, very educational and fun. We made memories that will last forever! The management company was very friendly and professional. Will consider returning in the future. Thank you for the feedback. We will check on that coffee maker and dust pan. Hope we see you back again soon. very nice place. 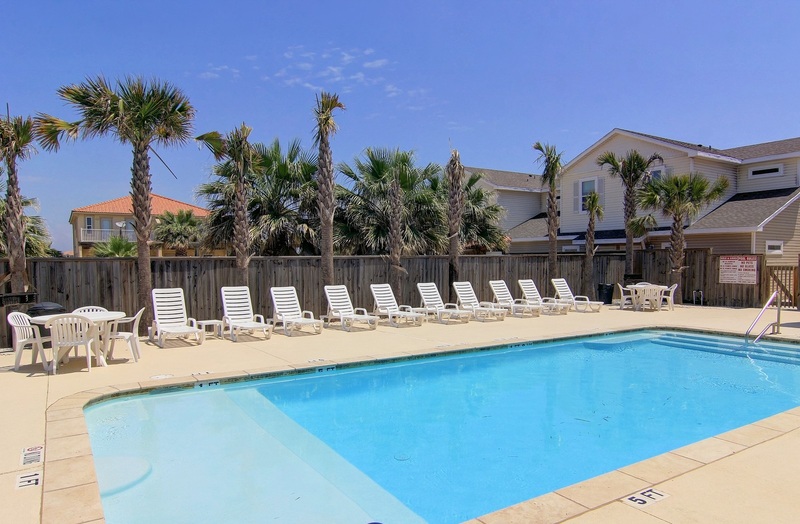 Short walk to the beach and when you don't want to be at the beach you can enjoy the pool and barbecuing. the only thing that we did not have were utensils for barbecuing and something to make pancakes and heat tortillas on. . other than that it was perfect. We just love to cook and eat!! Our family will be back and sure to let others know about this location. We have added utensils for barbecuing since your comments. Thank you very much for the feedback and helping us to improve the properties. We had a fantastic time. The place worked perfectly for all of us. There was more than enough room for the 13 of us, ranging in ages 1 to 63. It was the perfect distance from the beach and pool was wonderful! Great to hear you all had such a great time. We look forward to having you back again soon. This rental was in a good location and we liked the house but it was infested with ants and the property manger did not respond to our calls to take care of the problem. I apologize for the inconvenience. Unfortunately those sugar ants can be an issue at times here on the island, it's a never-ending battle but we did drop off ant spray for you and we have had regular treatment of the property. Very nice place to stay. It was a short walk to the beach. It smelled and looked brand new. Very nice neighborhood. Second stay in this facility and we will probably be back next year. Property it great and the few minor issues we have had were dealt with promptly. Great location with a short walk to the beach. This is the second time we have stayed at the Aruba Breach Getaway II. We love the place and will stay there again next time. We wish the AC in the main part of the house worked. We did call and turn it in but the termostat was always off. Thank you for your feedback. We have gotten an AC repair man out there since and it was only a minor connection issue with the AC thermostat that has since been addressed. Thank you again for your feedback, hope we see you back again soon. I can honestly say that by renting homes yearly around this location this is by far the best one. We loved everything about our stay. The amount of rooms was great. The kitchen and living room was open. The pool was right outside the back porch. Beds were comfortable and clean, which is something I always I look at. This is our 2nd year to stay here and we will definitely be back. We booked both sides for our large family. Love that most of the beds are either queen or king. The pool right outside the door is another wonderful perk. It's within walking distance (a couple of blocks) to the beach, and there is a large parking lot right next to the beach if you want to drive. Schlitterbahn is about a mile away and there are several good restaurants within a couple of miles. We love Snoopy's. HEB is only a couple of miles. There were a couple of problems but they were fixed right away. They were having AC problems before we got there, but the repairman was there within a few minutes of our checking in and it was cool shortly thereafter. The refrigerator wasn't as cool as it should have been in one unit. They sent someone to look at it and it got a little cooler, but never quite as cool as the one next door. They explained that it sometimes warms up while being cleaned between bookings and takes awhile to cool off again. Once again we Enjoyed our stay at Padre Escapes. The home was located in a great spot. Nice amenities. Very clean when we arrived. Great to hear, looking forward to having you back again soon! We had a great holiday, home was close to the beach and shops. Lots of room for our family of 10. Thank you for the feedback, we look forward to having you back! We really enjoyed our stay at this property. It had plenty of room for the whole family. I loved having the pool steps away from our back door. It was very clean and had everything we needed. The only suggestion I would make is to add hooks in the bedrooms to hang towels and hooks on the patio for wet swimsuits. Overall my family will definitely stay here again. Our family - my wife and I, two adult children with spouses and five grandchildren stayed for six days the last week of June. We had a grand time. One minute by car from beach - very clean pool and lounging area with lots of shade and seating. Only comment would be that if youre planning to cook in a bunch, the age/condition of the cookware will disappoint those of us who are spoiled by what we have at home - just a note, not a criticism- it is after all a rental property. Washer & dryer work great - a must with eleven of us and wet beach towels!! Thank you for the feedback, we will double that cookware and make any changes that need to be made. Our experience with everything from the rental company (Padre Escapes) to the house was fantastic. This was the third time we stayed in either side of this duplex and we will continue to do so every time our business takes us to Corpus. The house is in great condition. We enjoyed cooking meals in the kitchen. The college students with us enjoyed the shared pool out back. It's literally steps away from the back door.